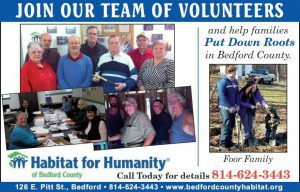 Habitat for Humanity of Bedford County serves all of Bedford County, PA. If you would like to volunteer to provide general construction assistance for a Habitat project, serve on a committee, or provide general non-construction/other assistance, please fill out the appropriate form below. If you would like to serve on a specific committee, please let us know (Family Services, Resource Development/Public Relations, Site Selection/Construction, Church Relations/Volunteer Recruitment, and Budget/Finance). Please note that your spot is not reserved until you have been notified with a confirmation message. Please call the office at 814-624-3443 if you would like to volunteer. *There are work restrictions for youth under the age of 18. “We undertake our work to demonstrate the love and teachings of Jesus, acting in all ways in accordance with the belief that God’s love and grace abound for all, and that we must be the “hands and feet” of that love and grace in our world.